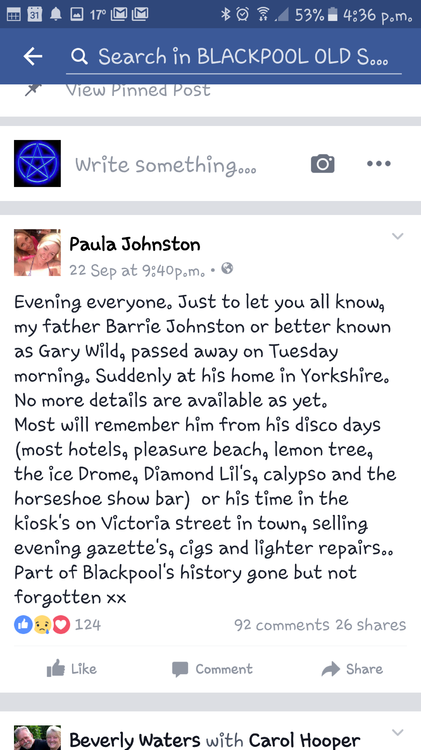 Just learned today that disco DJ and one of the founder members of the Blackpool Casino Soul Club back in the 70s has passed away suddenly at his Yorkshire home... Zaney DJ Gary Wild best known for his resident spot in Diamond Lils on the Pleasure Beach was at home with family. Along with the late Baz Stanton and fellow DJ Poth.. Gary opened up the Blackpool Casino Soul Club in the Pleasure Beach building opposite the Noahs Ark attraction back around 1975... Along with the Mecca.. Lemon Tree and Lytham Football Cub soul nights Blackpool Casino was instremental in bringing Northen Soul to many of us who lived in and arround the Fylde area. Condolences go out to Garys family... To the soul crowd in Blackpool in the 70s Gary was a legend an a loveable character.... R.I.P. GARY WILD (aka Barry Johnston).